The Asterisk War: A transfer student (does it seem that a lot of anime series have a transfer student?) arrives on campus and finds a handkerchief. Instead of returning it the old fashioned way using an elevator, he uses his three dimensional navigation ability to leap through the open window a couple of dozen stories up. Of course, there was a woman changing. By this time, I was wondering if I wanted to watch a show that felt so cliche. Julis has a temper — and a flame attack that exemplifies it. Capture from Crunchyroll’s stream. The story started the gather steam, and my resolve wavered. It was the last scene that hooked me. Ayato Amagir, the main character, watched Julis-Alexia von Riessfelt, the woman whose dressing he had interrupted, power up in response to a challenge. 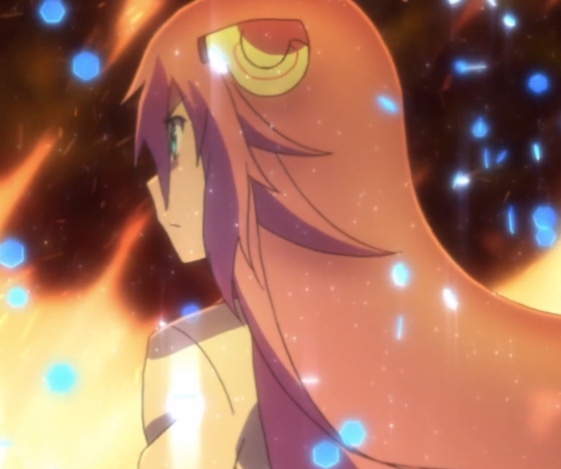 Avato said, “Julis… Julis-Alexia von Risselft… Clad in flames … The witch of the resplendent flames… ” Frankly, I’m a sucker for such romantic, poetic imagery. So, I’m watching this series. Beautiful Bones: Shoutarou Tatewaki, a high school student, befriends an eccentric twenty-something woman named Sakurako Kujo who loves skeletal remains. As Anime New Network pointed out, it’s a lot like Fox’s Bones, but for anime (you can buy the Fox version on Amazon). The police seem to give Shoutarou a lot of leeway, so in some respects it feels a little unrealistic. On the other hand, I liked to vibe I got from it, so I think I’ll keep watching it. 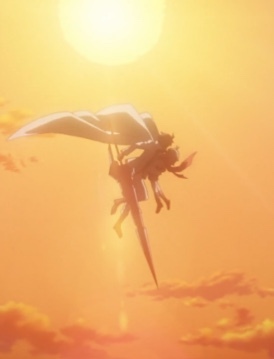 Yōtarō saves Makio after she falls during her self-imposed training. Capture from Crunchyroll’s stream. Yōtarō Hanabusa leaves his knight school to go into the world to find his calling. Hungry after traveling, he hears Makio Kidōin falling during her training regimen. Using his knightly powers, he changes form and saves her, and she hails him as a hero. It doesn’t feel 100% fresh and new to me, but I like noble sentiment, and I think this show might have it. I’m going to see where it leads. Utawarerumono The False Faces: A man with amnesia and dressed in a modern-day hospital gown wakes in a fantasy world. Running from danger to danger, he’s saved by a woman named Kuon. Kuon saves Haku and then tries to help him fit in with her village. Capture from Crunchyroll’s stream. She’s a cat-based woman (ears and tail), and she’s important in her village. She gives him the name Haku, and they try to find what he’s good at doing since everyone has to work or they don’t eat. Turns out there’s not a lot that he can do. It seems this is a “sorta” sequel to Utawarerumono, which is available for streaming on Funimation. I like science fiction more than I like fantasy, but this has a warm, human quality to it that I like. And Kuon’s cat ears look good on her. Anti-Magic Academy: The 35th Test Platoon: This series looks like it’s set in a world where witches and other magical entities threaten humans, so in response, humans established anti-magic schools. The story starts with the team of misfits led by Takeru Kusanagi seeming to suffer a near fatal loss in battle. Usagi Saionji, their sniper, seems to be the only one of the team in the field who’s not injured. Ouka Ootori is barely conscious lying against a utility pole. Kusanagi himself is bleeding out and expects to die. As he’s lying soaked in his own blood, some purple-haired girl wearing a blue dress congratulates him. Then the story jumps back in time to just before Ootori joined the team. She had been a top-rated Inquisitor, an elite among the anti-magic forces, but she did something untoward and got demoted. The characters didn’t leap off the screen in a fit of creativity and force me to watch, but the sum total of the action, characters, and concept kept me tuned in. 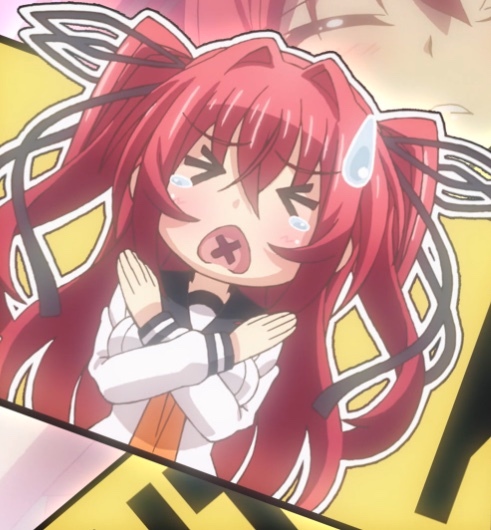 The Testament of Sister New Devil Burst: First, if I say I like this series, please don’t judge me! This is actually season 2, and it picks up where the first season left off. If you must censor, you might as well make it amusing. Capture from Crunchyroll’s stream. Our hero is Basara Toujo, son of a powerful human warrior and a powerful fighter in his own right. He’s protecting Mio Naruse, heir to the demon throne and sympathetic to humans, who’s under attack from (more evil?) evil powers. 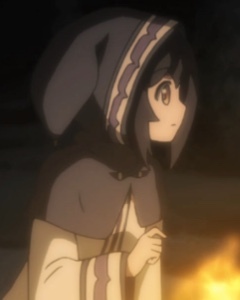 Yuki Nonaka, a school mate and member of the village Basara used to live in, helps protect Mio. So far, it sounds normal enough. But throw a succubus named Maria Naruse in the mix, and, well… Given that a succubus‘ super power is usually considered to be sexual, you can probably guess how things unfold. In the first season, Marie said she was going to help Mio ascend to the throne by sexually enslaving Basara to her, thus ensuring his loyalty. The spell back-fired (not accidentally! ), and Mio became the slave. Eventually, Yuki ended up enslaved, and when her sister Kurumi showed up in the first episode of the second season… Like I said, don’t judge me! In all seriousness, there’s enough story to capture my attention, and Marie is such a delightfully “innocent” succubus that it makes the concept seem fresh to me. Plus, this series doesn’t use the bars of light to censure the explicit visuals. Instead, they use standardized images for each character. The make me laugh more than I probably should. There are a few other shows, like Komori-san Can’t Decline!, the Perfect Insider, and Owarimonogatari that I haven’t had a chance to watch yet. As a rule, I like to be gainfully employed, but it does cut into my anime viewing time. As usual, it looks like Crunchyroll has a good roster!